The Antelope Valley Transit Authority began service in the Antelope Valley on July 1, 1992. 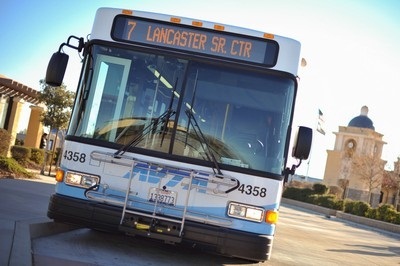 AVTA currently serves a population of over 450,000 residents in the cities of Lancaster and Palmdale, as well as the unincorporated portions of northern Los Angeles County. Its total service area covers 1,200 square miles and is bounded by the Kern County line to the north, the San Bernardino County line to the east, the Angeles National Forest to the south, and Interstate 5 to the West. The fixed route service area consists of approximately 100 square miles. AVTA operates a network of 13 local transit routes, four commuter routes, and one supplemental school route for the William J. "Pete" Knight High School. Local bus service is operated on weekdays from 5:00 a.m. to 12:45 p.m. Saturday service is operated from 6:00 a.m. to 11:45 p.m. and Sunday service operates from 6:30 a.m. to 8:45 p.m. Commuter services operate Monday through Friday from 3:45 a.m. to 7:40 p.m. AVTA also operates a midday service, known as the TRANSporter, that connects the Antelope Valley with the Santa Clarita Valley on week days. This service begins operating at 8:00 a.m. and continues until 5:50 in the evening. AVTA also provides urban and rural Dial-a-Ride service. Service within the urban zone and rural zone 1 is available to elderly persons and persons with disabilities. Service within rural zone 2 is open to the general public. Buses operate weekdays 6:00 a.m. to 7:30 p.m. and weekends 8:00 a.m. to 6:00 p.m. ADA complementary paratransit service is provided by IntelliRide. AVTA’s basic adult cash fare for fixed-route service is $1.50. Transit Access Pass (TAP). Free local transit service is offered to Medicare card holders, active military, veterans, and seniors with a valid Senior Annual Pass. The fare for ADA paratransit service is $3.00 for Zone 1 and $6.00 for Zone 2. AVTA operates a fleet of 75 buses for transit service with 45 buses dedicated tor local service and 30 dedicated to commuter service. Fifteen new diesel hybrid buses were added to the local transit fleet in September 2012, replacing older buses that had no useful life remaining. Six MCI commuter buses were also added to the fleet. Three replaced aging vehicles, leaving three more to provide additional service to valley residents. In 2014, two all-electric zero-emission buses were added to the fleet, with the long range plan calling for aging local transit buses to be replaced with all electric vehicles by 2018, and commuter buses to be replaced with all electric vehicles by 2020. The first 60-foot all-electric articulated bus in the nation was delivered to AVTA in May 2017. The current peak requirement for local service is 38 vehicles and commuter service is 25 vehicles. AVTA contracts with Transdev Inc. to provide local and commuter bus operations. The current Transdev contract was renewed on December 31, 2011. FTA recently approved AVTA’s request for a temporary waiver of the 20 percent spare ratio maximum in order to meet peak fleet requirements during a refurbishment of 13 buses. AVTA’s FTA-funded administration, operations, and maintenance facility opened in April 2004. A solar canopy covers a portion of the parking area. Phase II of the facility's construction was completed in January 2013. AVTA has transfer centers in Lancaster and Palmdale. These were built with local funds.